A snapshot of the recovery process stages, where do the numbers currently stand? Welcome to the start of our monthly overview of the recovery stages. Here, we’ll show you exactly how many loans are in each stage of the recovery process and going forward we can compare how it has changed from month to month. While we have tried to assign all loans to a specific stage as of the date of the report, the recovery stages are sometimes not promptly updated so individual loans may occasionally fall under incorrect stages. In case you missed our previous post, you might firstly find it useful to check out our 3 step collection and recovery process. This explains everything you need to know about each stage and sub stage you see above. 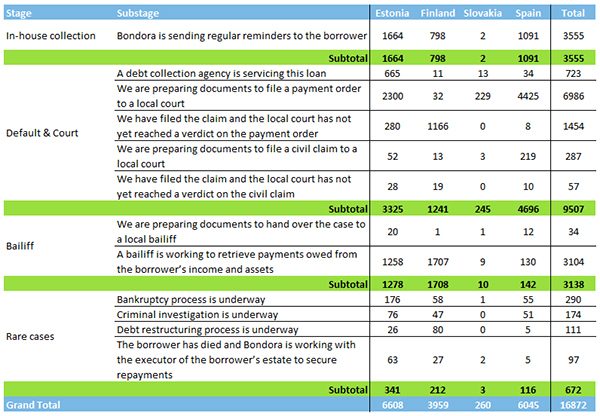 Soon, we aim to improve the view and reporting on your Bondora account so you can see all the information about what stage your loan is at in the recovery process along with a reminder of what happens at each stage. Why do Estonia and Spain have more cases waiting to be filed than Finland? Thanks to access to technology and cooperation with local courts, we have been able to automatically file cases in Finland with more speed and efficiency than other countries. The success of this is also visible in the section showing how many of these cases are now with the bailiff. Going forward, we will soon have access to similar technology in Estonia, Spain and Slovakia which will allow us to progress each case to the bailiff stage at a more efficient rate. After we have implemented the changes to improve the ‘Default & Court’ phase, our next priority will be to improve the cooperation and data flow with the bailiff’s as we start to hand them more cases. It’s important that we get this right because it will help us get accurate updates on the progress that they are making with individual loans, in turn allowing us to update our investors with this information on a more regular basis. Next month, we will do a comparison of how the cases have moved and why.